​Although there is no clear definition, we can safely say that wetroom is a bathroom which has a shower, but no shower tray nor bathtub. How is this done? 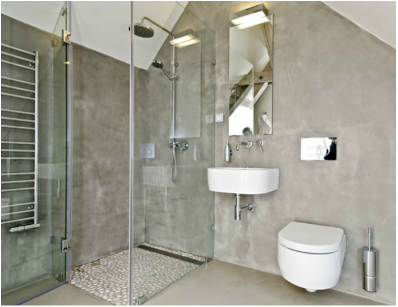 By simply waterproofing entire bathroom – floors, walls and sometimes even ceilings. The idea was around for decades, but recently among bathroom refurbishments in London it gained much more popularity. Apart from giving more spacious feeling it is also the most convenient type of bathroom for persons on wheelchair. From builder’s and designer’s bathroom fitting point of view, the main difference is floor level – from outset it has to be prepared to include a gentle slope, to force all water towards drain. Can I have a wetroom? ​Theoretically, wetroom can be installed anywhere within a house. In general, designs of wetrooms strive to achieve a seamless floor throughout whole bathroom so as to achieve most of its benefits. In some cases it is not possible, usually when there is not enough space within the floor to contain necessary drains and traps, etc. Still, this does not rule out installation of wetroom, if floor can be raised over part of bathroom. Also, in smaller bathroom designs, i.e. ensuite wetrooms, it may be necessary to include shower doors and panels to prevent water from splashing over toilet rolls, towels, etc. The only critical feature is sloped floor and waste outlet to the lowest point of the floor. Although height difference is usually just an inch or so, in some instances distance between floor joists and possible finished floor level is simply not enough. Positioning of bathroom furniture – take into account that splashing water may land upon towels, toilet rolls, etc. If there is not enough space to prevent it, include shower doors and panels to divide bathroom. With modern frameless glass designs it can be very stylish. Glass doors and panels – most bathrooms are relatively small and hence require custom size glass panels and doors in order to utilise available space most efficiently. If there is an angled ceiling, this solution is a must. In big bathrooms it is rather a question of design, however please note that large panes will require additional stability, usually by means of support arms. Ready-made shower formers to be tiled over. They require wastes specifically designed for them. Custom-made floor bases, sometimes known as Hi-Macs, which spread over entire bathroom area. These do not have to be tiled as they are available with a number of finishes. On-site built subfloor. Requires very proficient fitters who have to take every detail into account. However it allows for the most flexible design to include customer’s every wish, for example a stylish linear drain or underfloor heating. This is our recommended bathroom fit out as it allows creating wetrooms out of most of the bathrooms in the smallest of bathrooms. We use special wetroom matting to accommodate any movement of tiles, spread the pressure and protect the waterproof layer from damage. Raising bathroom door threshold – some customers are concerned with possibility of water spilling out. However, with a well executed sloping and sufficient area this is not necessary. 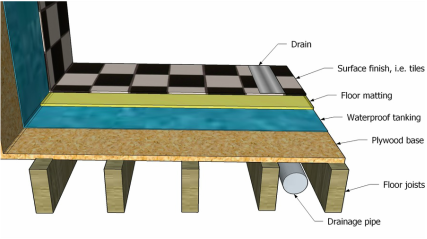 Cost – extra tiles, IP rated waterproof lights, waterproofing to floor and walls, altering floor structure, among others. Despite its many advantages, wetroom installations are still costlier when compared with shower cubicles.